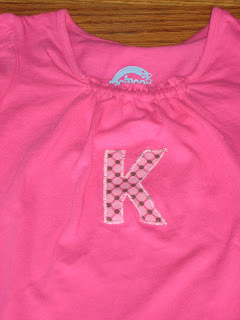 For those of you waiting patiently for your monogrammed shirts and onesies....I have not forgotten you. The beginning of school for one son and therapy changes for another have temporarily stopped my sewing projects. I am happy to say that I am starting to get back in the swing of things. 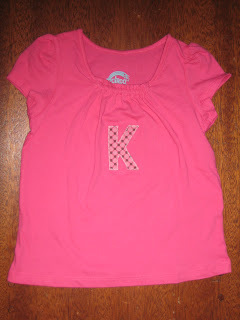 This shirt is for Karis, I hope you like it! The goal for the rest is the end of this week, so with a little bit of luck, I'll have the rest of them up (and mailed) soon. You are awesome Britt! I tried to do one on my own and it turned out scary! I need a lot of practice!